We’re battling invasive plants along BC highways, and we’re enlisting Adopt a Highway volunteers to keep these unwelcome intruders from capturing more territory. Adopt a Highway volunteers are our allies in the attack; because they’re on the ground on assigned sections of BC highways. To arm them for managing invasive weeds, we’ve got a new video showing how to spot, report and remove invasive weeds. The pulling weeds part is optional, but for groups that want to jump in with both hands, they’ll receive in-person training from a regional expert on invasive species. Another great resource for Adopt a Highway groups (or anyone wanting to keep invasive plants off their property), is the Report a Weed app, available on the B.C. Interminstry Invasive Species Working Group website or the App Store, for iPhone and Android mobile devices (it’s free too). The app has a catalogue of invasive weeds, offering photos and descriptions, and even the ability to view invasive weeds in colour groups. App users then take a photo of what they see and report it. The app is extra helpful because, if plant spotters are out of cell range, they can submit the photos and facts about the plants’ location and, once cell connection is re-established, the app automatically sends the information. The report goes into the Provincial Invasive Alien Plant Program database, where all infestations reported are reviewed during annual treatment planning. The reports from Adopt a Highway volunteers are especially helpful for effectively tackling new sites of invasive species. Treatments are more successful and less costly on newly established infestations, as compared to larger ones which can take many years to control. Volunteers who don’t go the app route, can report an invasive species (plant or animal) to The BC Inter-Ministry Report an Invasive Species website or by calling 1-888-WEEDSBC. We’re full-on about battling invasive plants because they destroy fish and wildlife habitat, harm rangeland and cause damage to our ecosystem and people’s livelihoods. Intervention is needed because they have no natural predators to stop their spread. 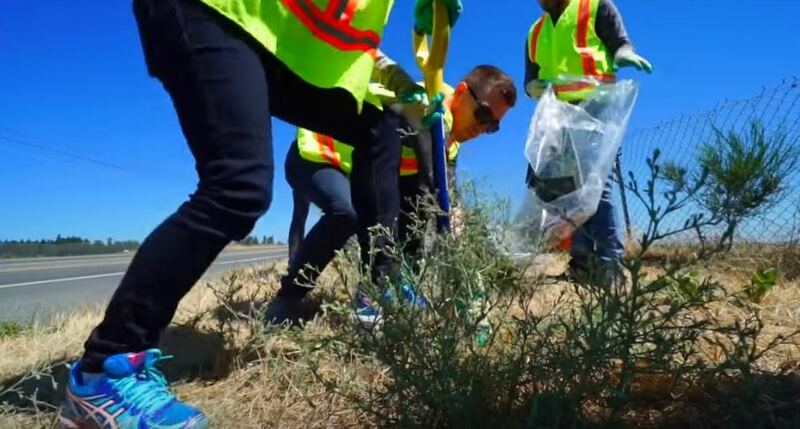 We hope you’ll join our plant spotting corps as an Adopt a Highway volunteer, to report weeds and maybe even bash some Scotch broom or give baby’s breath the boot. To learn more, see our 14 Reasons to Adopt a Highway , watch our new video, and check out the stretches of BC highways available for adoption. If a group removes and stacks five tonnes of broom on the side of the road, is there any option for Mot to remove or support the removal with traffic control? If you let the district office personnel know, they will have the maintenance contractor pick it up. Hope that this helps!